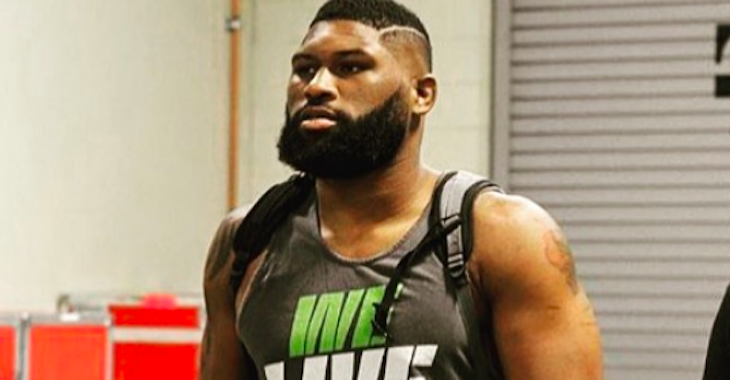 A key heavyweight scrap between former title challenger Alistair Overeem and surging division contender Curtis Blaydes served as the featured bout of tonight’s UFC 225 prelims on FS1. 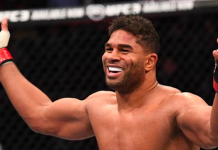 Former Strikeforce and DREAM champion Alistair Overeem entered tonight’s contest with a 43-16 overall record while his opponent Curtis Blaydes entered the matchup 9-1. Round one begins and Blaydes takes the center of the octagon. He is using a lot of movement early. Alistair circles along the fence. He comes forward and meets Curtis in the middle. Neither man has thrown a strike yet and we are a minute in. 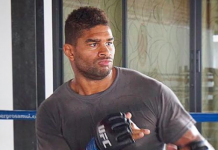 Overeem is clearly looking to counter. He continues to retreat as Cutris presses forward. Blaydes is looking to find a way inside. He finally throws a head kick but Overeem steps out of the way. Alistair is being very patient. He is looking to figure out Curtis’ timing. Blaydes shoots in and scores a big double leg takedown. He immediately passes to half guard. Overeem tries to tie him up. Blaydes and Overeem are both throwing weak punches from the position. Overeem eventually scrambles and gets a hold of Blaydes’ leg. He looks to secure a leg lock but the horn sounds to end round one. Round two begins and Blaydes comes forward quickly. He throws a right hand but Overeem lands a beautifully timed knee. That wobbled Curtis. Overeem with a right hand and then an uppercut. Blaydes shoots in and scores a takedown. 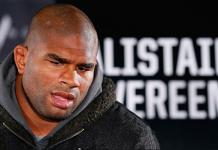 Overeem is able to scramble and get back to his feet. Blaydes immediately presses forward and lands another takedown. He begins working from full guard and then eventually moves to half guard. Cutris begins to work in some shots now. He lands a nice right hand from the top. He postures up and begins dropping bombs on Alistair. Overeem is able to scramble and then ties Blaydes up. The horn sounds to end round two. Round three begins and Blaydes lands a knee to the body followed by a right hand. Overeem with a big kick to the body. He presses forward but Blaydes lands a nice counter punch. That backs Overeem up. Blaydes leaps in with a flurry. Numerous punches land. Alistair appears to be hurt. Blaydes lands an uppercut and then shoots in for a double leg takedown. He gets it. Blaydes immediately moves to half guard. He works in some short shots from top position. Alistair scrambles and gets back to full guard. Blaydes postures up and begins raining down shots. Huge elbows. Alistair is pouring blood and this one is all over! WOW!